This is Riggun with his cowboy hat great grandpa & grandma Robby gave to him. Every time he gets on his rocking horse he says "yeehaw" it is so cute. He is really good at making animal sounds and i bet you can't guess what his fav one is? Anyway back to his hat, he sleeps with it a lot. 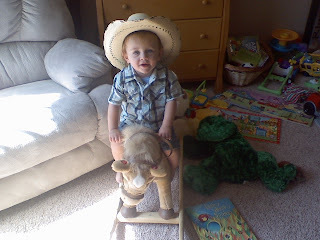 I think we have a future cowboy on our hands!